A, creatures that are organic parts of the game: GUIDE, BABOON_NORMAL, TROOPS etc. B, creatures that are only decorations: the lizards of 'Race for the Iris' level of TR4, the friendly fish in FISH_EMITTER object etc. The theme of this tutorial is the B type: the tutorial shows some interesting solutions for the B type creatures. Use this man in the WAD of your level in any ANIMATING slot. For example, ANIMATING1. He is one of your pedestrian now. When he's triggered then he'll start walking. At the end of his route he will be put back to the start of his route. From here (because he's not antitriggered) he will be walking on until he reaches the end of his route again. Where he will be put back to the start of his route again. - And that will be going on for evermore. 1. How will he be put back to the start of his route? 2. Why will he be walking for evermore? 1. A HEAVY trigger marks the end of his route. If he steps on the square with this trigger, he will activate it. (He can activate it thanks for NEF_EASY_HEAVY_ENABLING constant of Enemy script command. - See more in NG Center\Reference.) This trigger is an 'Enemy. 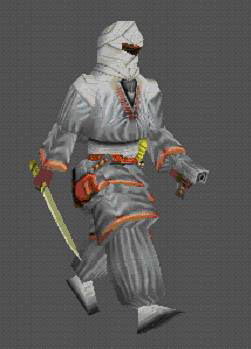 Move immediatly <#>enemy in lara_start_pos with (E)OCB setting' ACTION trigger. #= this ANIMATING1 object, E: a LARA_START_POS object with a number in its OCB window (choose any number). This trigger transports this man to this LARA_START_POS that is on the square where he was placed in NGLE (i.e. the start of his route). - Be careful: maybe you have to rotate LARA_START_POS so that the man will be walking on from here in the right direction. 1. Naturally, you can have more pedestrian routes, if you place more ANIMATING1s, and one starting trigger and one HEAVY and one LARA_START_POS for each ANIMATING1. Moreover: naturally, you can use any other object in any other ANIMATING slot, if you don't want all of your pedestrians to look like this mourning man. 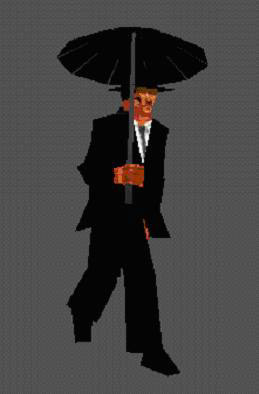 The player can't see when the mourning man starts walking because the man is placed in a small closed place in NGLE. When the man is triggered then a door will be triggered too: right in front of the man. So the player (with Lara in the street) will see the man stepping out of a building into the street, opening that door. (The door is timed so it closes right away behind the man.) Then the player will see the man walking until he reaches the mouth of a tunnel. The man walks into the tunnel then disappears far away in the dark. Then the player will see another man stepping out of that building, opening that door etc. - The small closed place and the tunnel are closed to Lara and she can't get in. (Or else the player will see the man jumping from the end point to the start point. And this is unrealistic, of course.) So you have to use PANEL objects - see Collision demo project - to prevent her from getting into the building or the tunnel. - ANIMATINGs, like this man, ignore these objects, so these are not obstacles for them. So, the man starts from LARA_START_POS object with 0 OCB window value (LSP0). He reaches the first HEAVY trigger (H1) that will transport him to the LARA_START_POS object with 1 OCB window value (LSP1). Then the man reaches the second HEAVY trigger (H2) that will transport him to the LARA_START_POS object with 2 OCB window value (LSP2). Then the man reaches the third HEAVY trigger (H0) that will transport him to the start position (LSP0). These HEAVY triggers are all 'Enemy. Move immediatly <#>enemy in lara_start_pos with (E)OCB setting' triggers. - Be careful! In some situations you may notice that all/some Moveable objects of the room (wherefrom the jump will happen) will become invisible when a room-leaving jump happens. a PARAM_MOVE_ITEM type of Parameters script commands and a FLIPEFFECT trigger to activate it to make the man move vertically during his route. This ACTION/FLIPEFFECT is a HEAVY and activated by the man when he reaches the top of that stairs. *: Write a number in the OCB window of the object: this is the speed of this moving. a Turn ACTION trigger or a PARAM_ROTATE_ITEM type of Parameters script commands and a FLIPEFFECT trigger to activate it to make the man turn around. This ACTION/FLIPEFFECT is a HEAVY and activated by the man when he reaches that corner. 6. If Lara begins fighting an enemy in a busy street the pedestrians will run away and after the fight they will come back. - Oh, that would be great if I knew how to edit it. But I didn't: if the fight begins the pedestrians won't do anything else but do their things as usual. 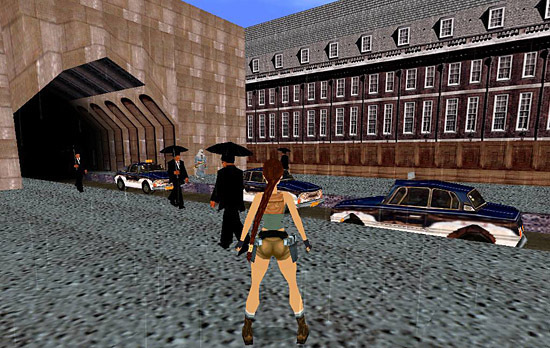 a, Don't let Lara have any weapons in her hands when she's in a busy street. (For example, using these FLIPEFFECTs: 'Lara. (Weapons) Remove weapons or flare from lara's hands' and 'Lara. (Weapons) <&>Enable/disable usage of weapons for Lara'.) When Lara's left the street then you'll allow her to use weapons again (with another 'Lara. (Weapons) <&>Enable/disable usage of weapons for Lara' trigger). b, Use the grey 'Box' button (or a door object that closes just in front of the creature) so the enemy won't be able to follow Lara into the busy street. 7. Save memory: antitrigger these pedestrians when they're just out of the player's POV (they stop just where they are), and trigger them again when the player can see them again (they move again from the point where they stopped). 8. Of course you don't need these endless routes everyway. I mean if you want a single pedestrian in its route then you don't need to transport it from the end point to the start point. In this case all you have to do is place the creature, trigger it and place a HEAVYANTITRIGGER at the end of its route to deactivate itself. 9. My experience:NEF_EASY_HEAVY_ENABLING constant will never be valid for the moves that are animated by emitters. There's only one animation of the animations of this ANIMATING that we care about now - the walking animation: Animation32. You have to copy this animation to Animation0 in the Animation Editor of WADMerger, because Animation0 is the general beginning animation of every ANIMATING. b, This Animation0 is a loop animation, so NextAnimation=0 and NextFrame=0. c, StateID is the general state of any ANIMATING: 0.
d, State Change Editor must be totally empty. After this, do everything about this pedestrian just like you would about the mourning man above. 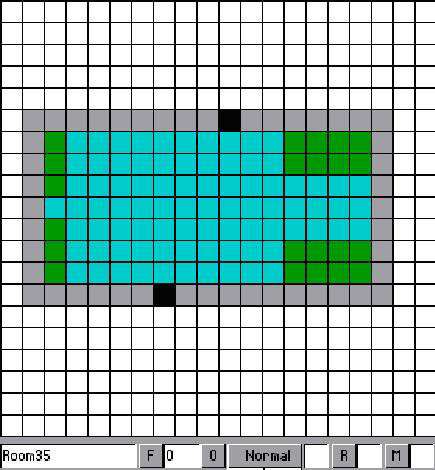 Be careful: if this setup is too complex then the ANIMATING may miss some HEAVYs that it's not allowed to miss. 2. Let's suppose you want to see a harmless dog walking in the street. So you'll do the same with the dog (taking DOG enemy into an ANIMATING slot) as you did with the ANIMATING baddy: you'll take its walking animation, place it into Animation0, then change it. Copy this ANIMATING9 into your WAD. a, The car doesn't have any moving animation. So you'll make one. b, The car must have some engine sound. So you'll give that one. a, Of course, you have to use Animation0 again. Now you can see this here: FrameRate=1, Speed=0, StateID=0, Accel=0, NextAnimation=0, NextFrame=0. All you have to do here is write a speed value. Negative value this time or else the car will move backwards. (I think -200 is a good value for a fast car.) - Be careful: a minus sign in Speed window without numbers may crash WADMerger. - You can't use a Sound icon: because it's still, but the car is moving. - So you'll use a 'Play Sound' AnimCommand in the Animation Editor of WADMerger. But a loop sound won't play well with Play Sound - in spite of the 'moving jeep' loop sound (JEEP_MOVE, ID: 155) would be great for this purpose. So you'll use a single sound: add it to the only one frame (frame0) of the Animation0, using Play Sound AnimCommand. - If you use PARAM_MOVE_ITEM or PARAM_ROTATE_ITEM for moving then you may also use these constants to add sounds to the car. This trigger decreases Lara's health with 10 percents. 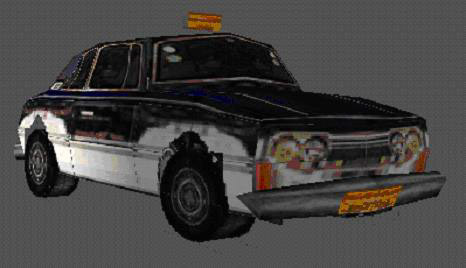 So, the GlobalTrigger says: 'every time when Lara touches a taxi she will loose 10 percents of her health'. - This 10 percentage is maybe not the proper amount. It depends on the speed of the car. - I think a hurt caused by the side of the car is not unrealistic: 'the car sweeps away Lara'. - Cars won't run over pedestrians or enemies. So don't let the pedestrians (not crossing their routes with the routes of the cars) or the enemies (for example, using 'Box' button) get close to the cars. - You don't need to use starting trigger and HEAVYANTITRIGGER, if you want a single car (see Chapter#1 note#8). I mean, as the car has no animation with more frames (because the only one animation has only one frame), you can do that you place the car and move it with only PARAM_MOVE/ROTATE_ITEM constants now (or with the similar ACTION triggers). In the background you can see a tunnel that is forbidden Lara to get in. (Not the same tunnel that is in the example above.) You can use PANEL objects to prevent her from getting in there or (if the street and the tunnel are not in the same room, so the mouth of the tunnel is a door) you can use totally transparent textures at the mouth of the tunnel with 'Toggle Opacity' mode.